This is a long awaited post that I’ve been putting off since the beginning of the year. Don’t get me wrong, I love doing blog posts on the places we’ve visited and taking a trip down memory lane with where we went and what we did. 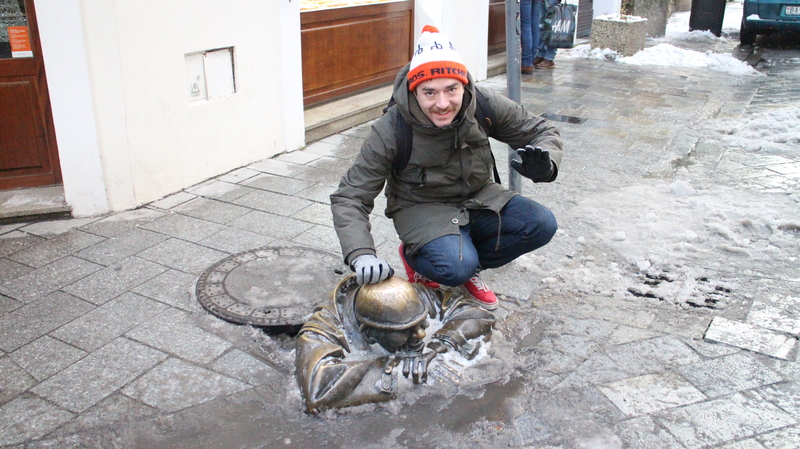 However I wasn’t sure how I really felt about our time in Vienna and Bratislava and I wanted to make sure this post was as fair as possible. 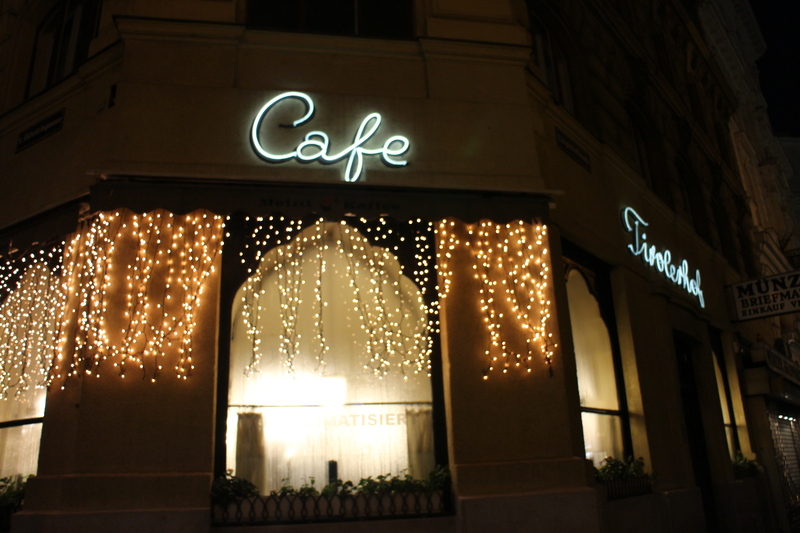 Laurence and I went to Vienna in the Christmas and New Year break along with my dad and his wife Suzie and we also took a day trip to Bratislava once dad and Suzie had gone home (Bratislava is about a 40 minute train journey from Vienna so a day trip is totally doable). Before I give you a day by day break down of where we went and what we did, I thought I’d let you know why I wasn’t overly enthusiastic about the trip. 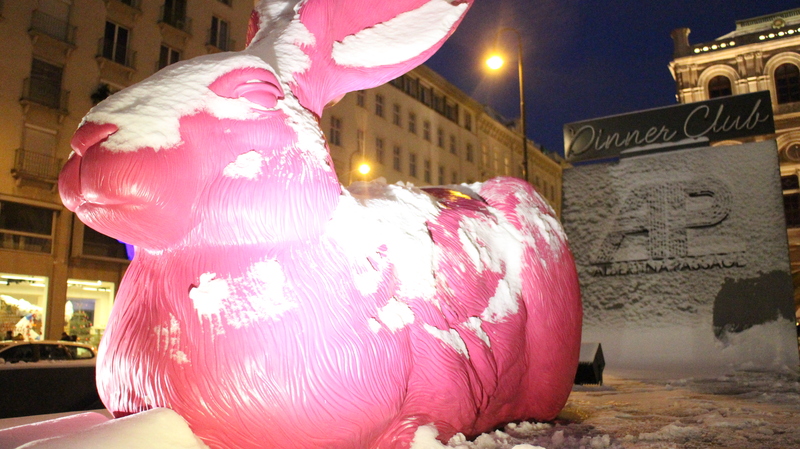 Vienna is a lovely place – it’s freezing in winter! But it’s full of some great restaurants, shops and museums. However I just wasn’t overly balled over by the place… there wasn’t anything particularly interesting to do, there was a bit of an odd atmosphere there (I’m not sure if that was to do with the fact Christmas was over and people were winding down?). We had a lovely time, however I’m not too sure if I would recommend it as a place to go – there’s a lot more interesting places to go above this place. 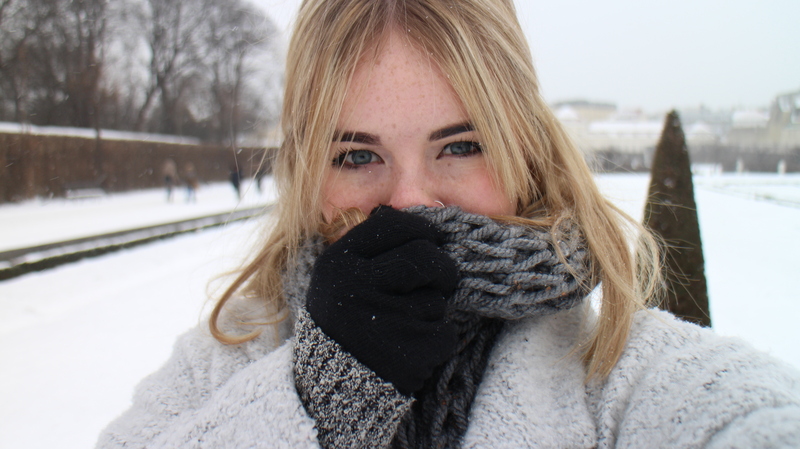 I just can’t quite put my finger on it which must be super annoying for you as you would want to know why I don’t recommend it… I just think you would have a better time going somewhere like Sweden or Amsterdam – but that’s just my opinion. 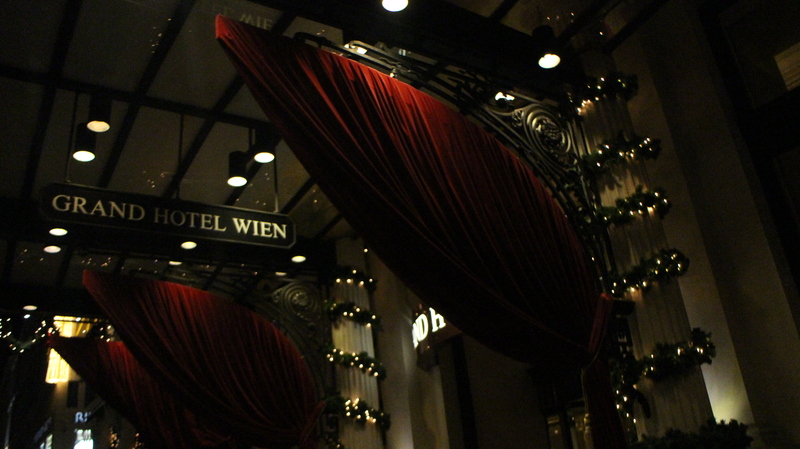 We arrived in Vienna at around 2pm and checked into our hotel, Hotel Topaz. I think the winner with this hotel was the amazing big oval windows in the rooms that have cushioned window ledges – they were pretty impressive. Although we did book and pay for rooms with these windows for both Laurence and I and dad and Suzie, but for some reason dad and Susie didn’t get a room with the impressive window but we still payed for it… If you decide to stay here, make sure you check with reception what you’re getting! 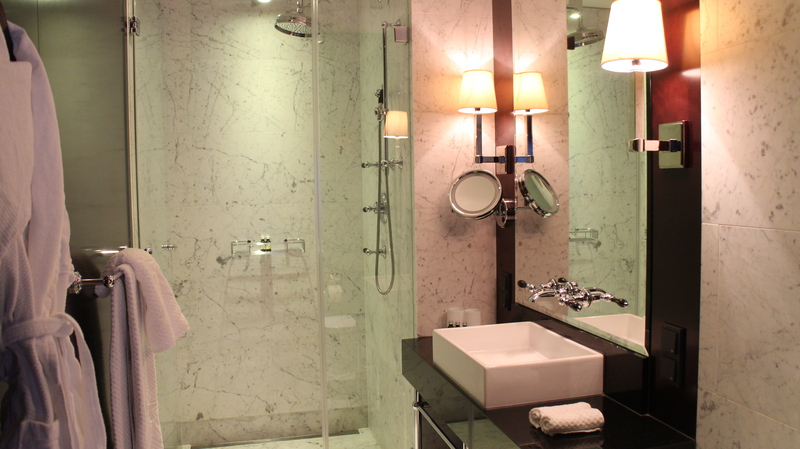 One other thing I loved about the bedrooms was the beautiful marble bathroom. The shower was amazing and has defiantly set me bathroom goals as to what I want my new bathroom to be like! I love it when a hotel gives you little welcome gifts in your room and Hotel Topaz did just this with these little Austrian cakes which were kind of like battenbergs – really sweet and a nice touch. 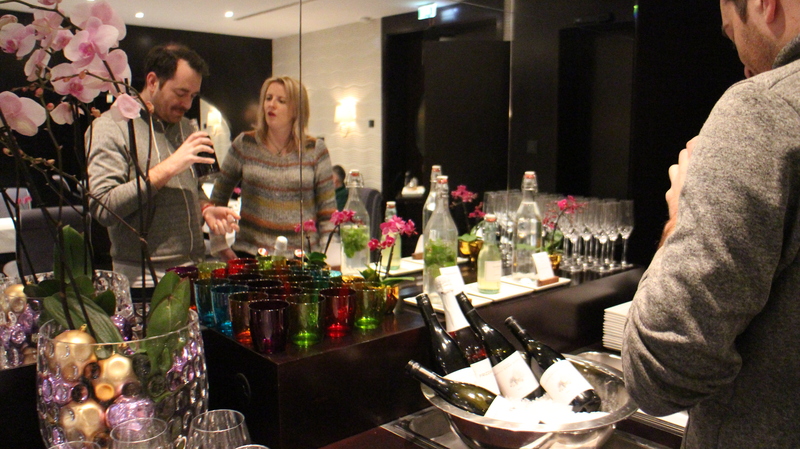 It’s also very rare that a hotel offers a free mini bar, we’ve only ever had this before in our hotel we stayed at in Rome, Hotel Topaz offered a free mini bar in your room with a selection of soft drinks, some wafer biscuits (always a hit with me) and I think a beer also. 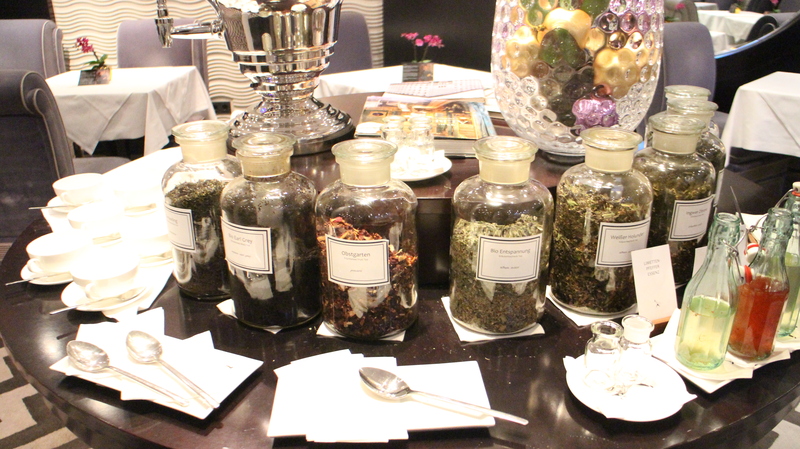 I just think its a lovely touch to offer this for free when you’re spending quite a bit of money on a hotel room. Hotel Topaz’s generosity didn’t stop there, they also have a restaurant/bar at the bottom of the building where they offer free drinks from wine to coffee and snacks from 10am – 10pm. I would defiantly recommend staying in this place, purely for their little acts of kindness really! The staff were also super friendly and helpful, they didn’t hesitate to help us when we asked them about where they would recommend for dinner or even printing off train timetables for us. 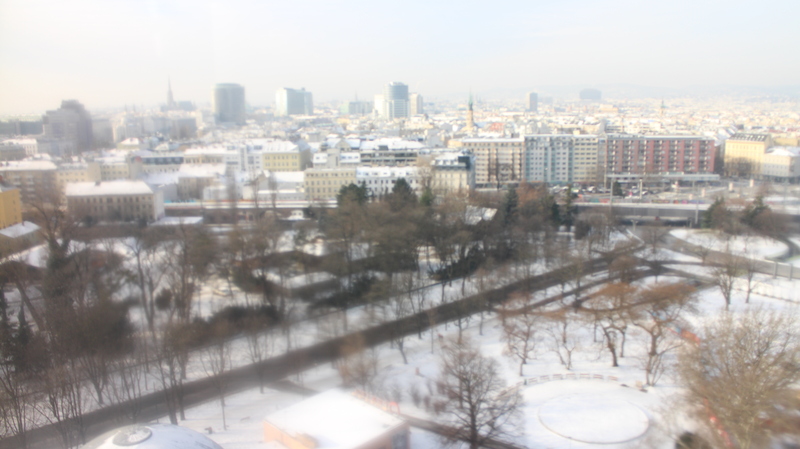 Once we had unpacked in our rooms and finished our glass of wine from the hotel free bar, we headed out to explore some of the city (with our sights set on getting ourselves a hotdog). 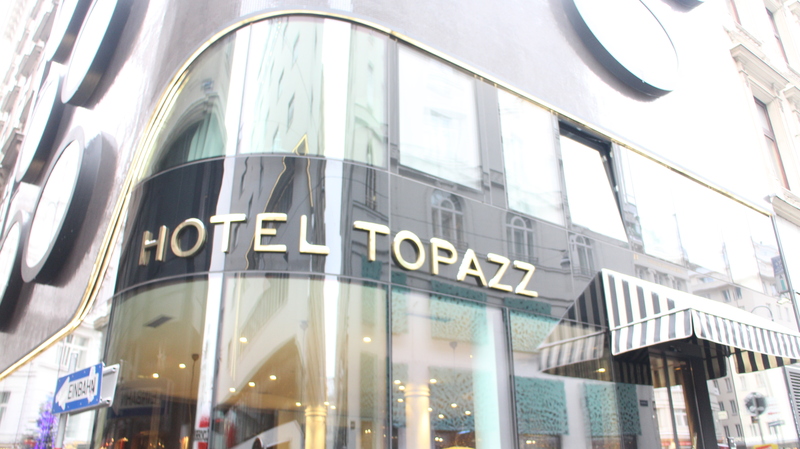 Hotel Topaz is a short 3 minute walk from St. Stephen’s Cathedral – the mother church of the Roman Catholic Archdiocese of Vienna and the seat of the Archbishop of Vienna, Christoph Cardinal Schönborn. 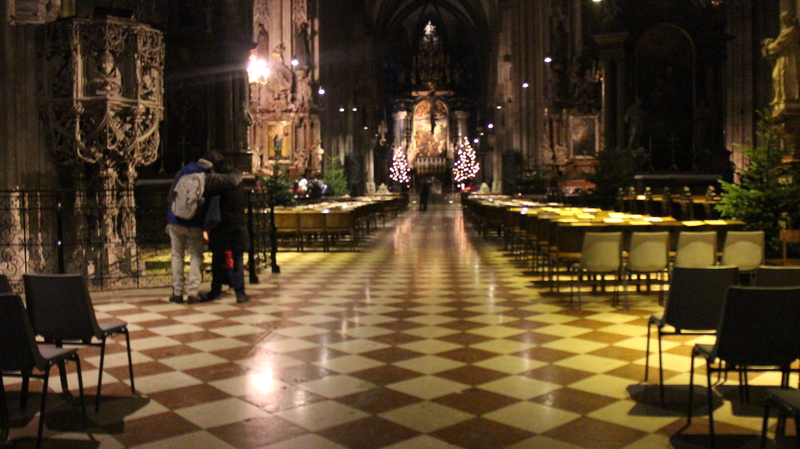 The church is smack in the middle of the center, extremely close to Vienna’s ‘Oxford Street’ and it’s pretty hard to miss, you can spot it from a good few miles away with its height and amazing chevron tiled roof. 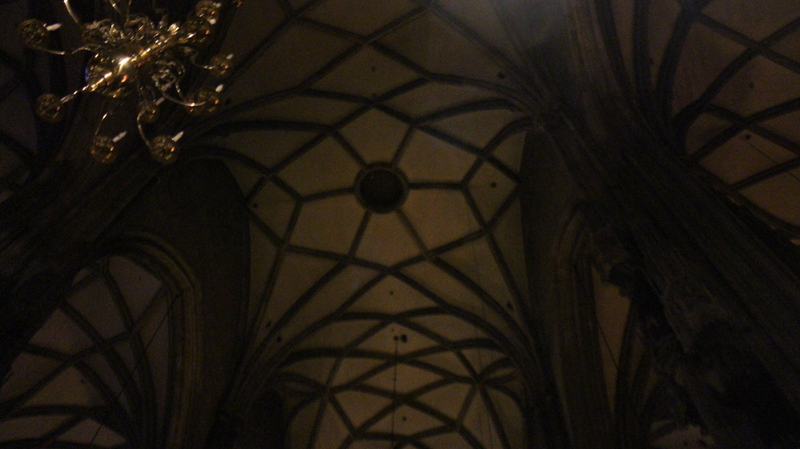 I can sometimes feel a little weird going into churches as I’m an atheist and I’m not really sure how I feel about the cost put into churches. However this was a really stunning church that was almost modest at the same time in terms of not being completely gilded and over the top. 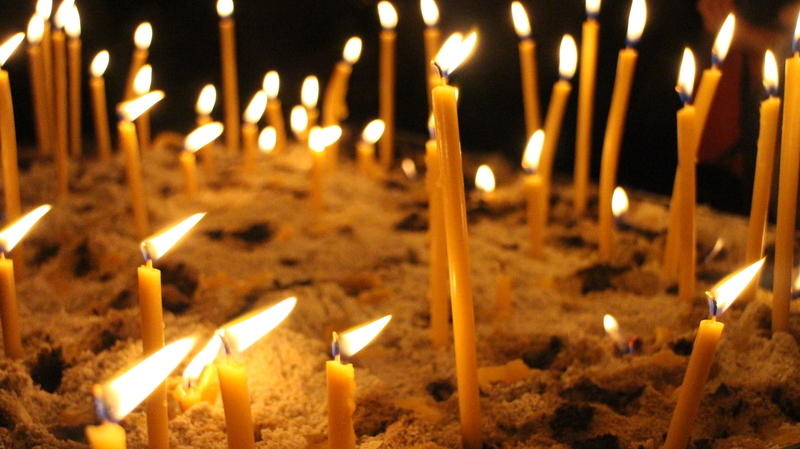 Although I don’t follow a religion, I can still appreciate a place of worship and I always love the feeling of calm and safety that comes when visiting a church. 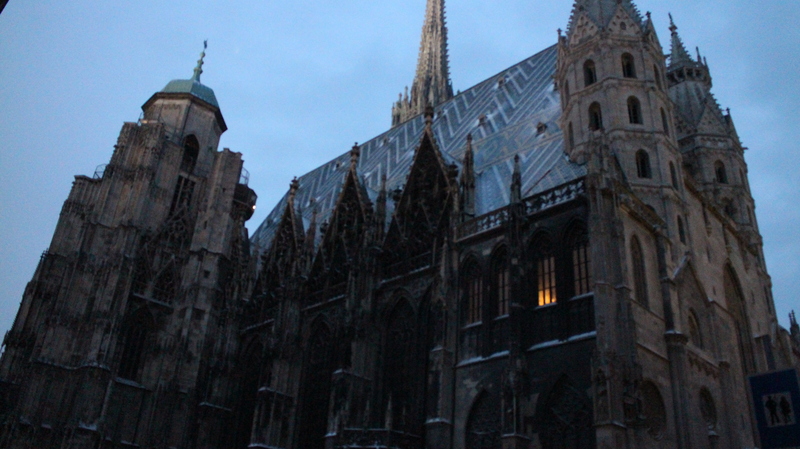 If you come to Vienna you have to come check this church out – you will be pretty impressed. However watch out for the actors outside the front of the church. They’re dressed up in costumes and are there to get people to sign up to tour guides and they can be pretty persistent and annoying, so don’t make eye contact and don’t speak to them if you’re not interested. By the time we came out of the church, we noticed we hadn’t eaten since the morning and it was now getting to 4pm so energy levels were slacking… a hot dog was needed. I’ve found that a lot of other European countries have a big culture for hotdogs, Iceland was very similar with their love for a good frankfurter – I think it’s a great obsession to have and I’m considering starting a petition to get hotdog stands put in every corner in the UK, starting with at the end of my road. 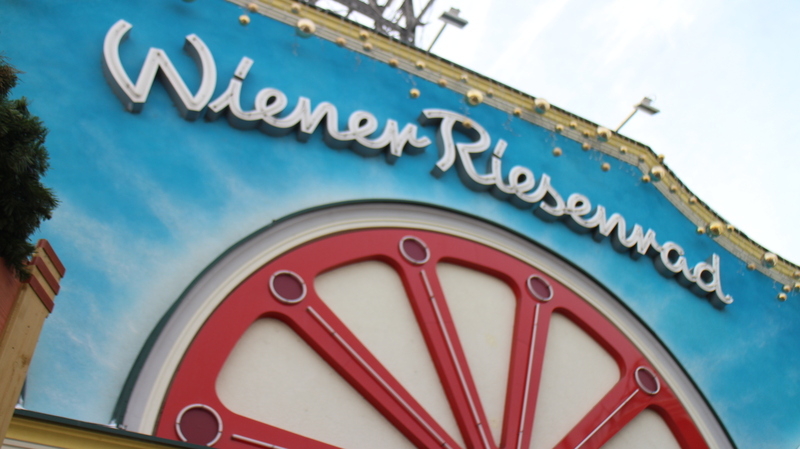 Laurence had done some research into a few popular stands and suggested we should go to one called ‘Bitzing Wurstelstand Albertina’ which is right outside the Albertina (very convenient for a snack after you’ve been to a show…). 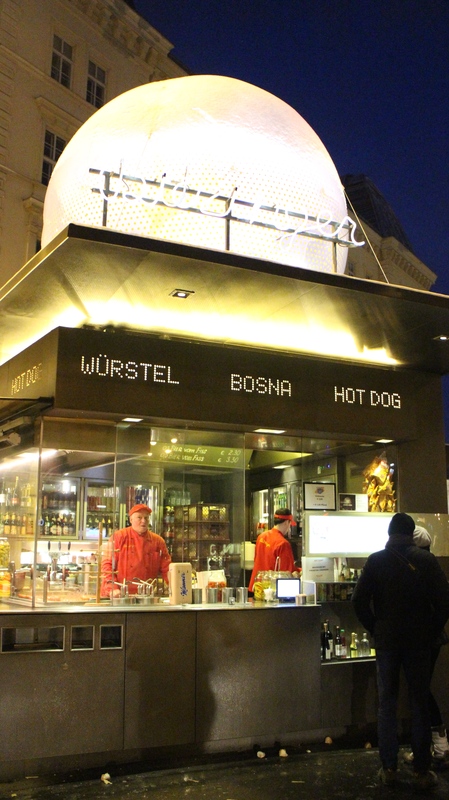 I was expecting a frankfurter and I think they had a few of those to offer, however we had a chipolata style hotdog which was pretty damn tasty! 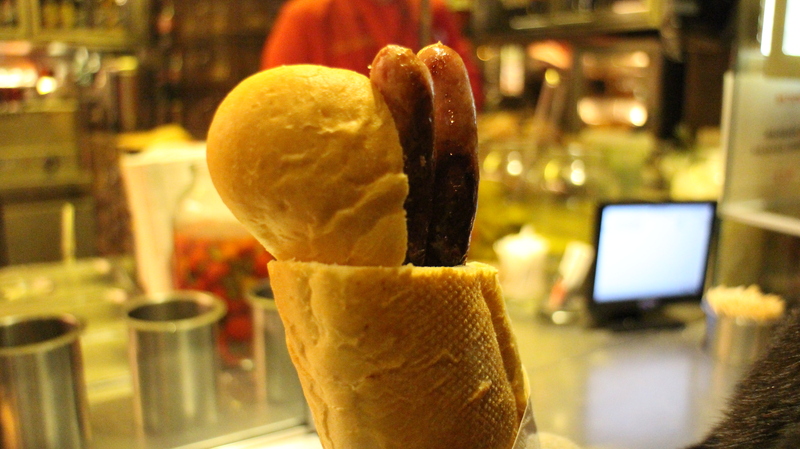 They’ve got a great way they prepare the bun where they put it on a pole so it creates a hole in the baguette and they then put the sauce in the hole followed by the sausage. A great idea which means you can easily eat the hotdog and not worry about getting all the sauce on your gloves or around your mouth – genius! 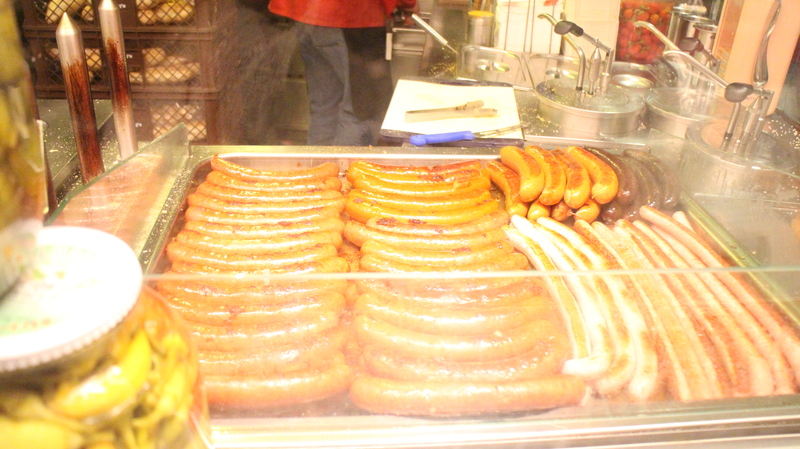 By the time we had finished out hot dog, we were getting really cold, so we went to find a cafe where we could warm up. 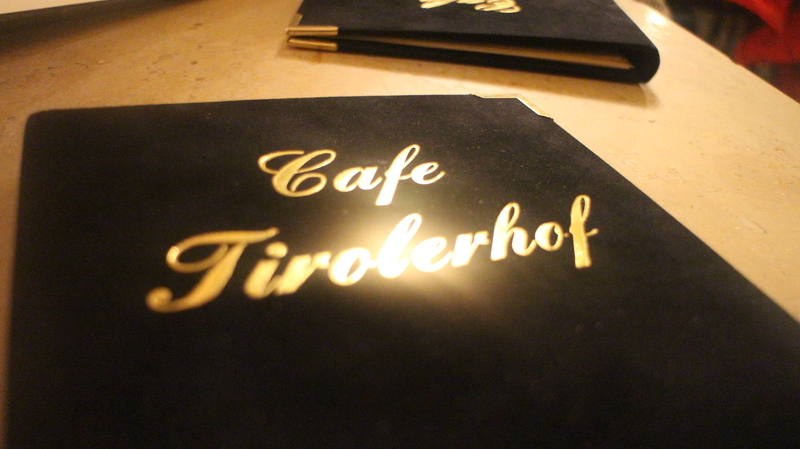 We stumbled across Cafe Tinolerhof a short walk down from the hotdog stand and it looked really cute so we thought we’d head in and take a look. 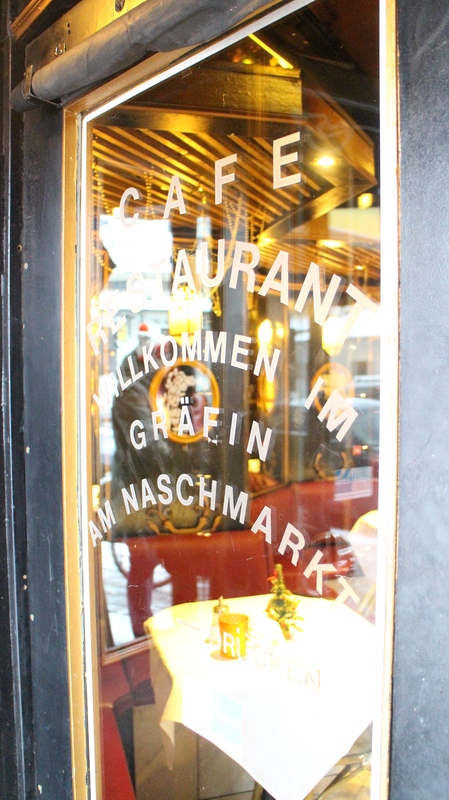 It seemed like a traditional cafe that had a cosy feel to it and the kind of vibe where you feel like you should be sat with an old classic novel whilst having a cigarette (I don’t even smoke) – very European. 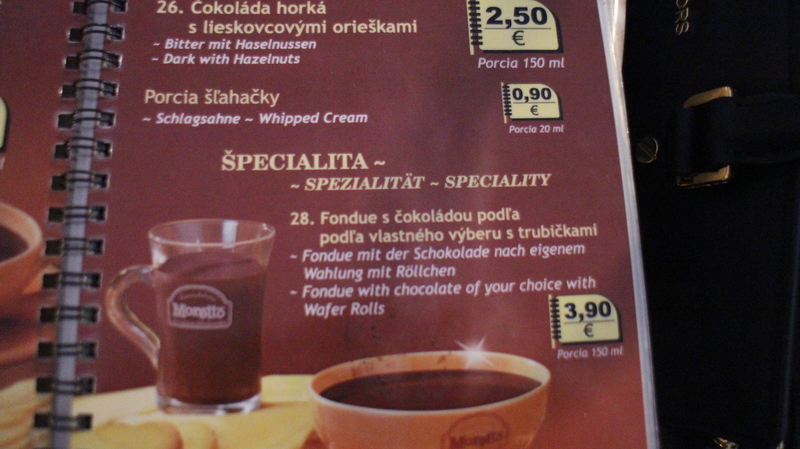 We ordered hot chocolates with amaretto and a slice of strudel which was just the hit of comfort and warmth we were after. 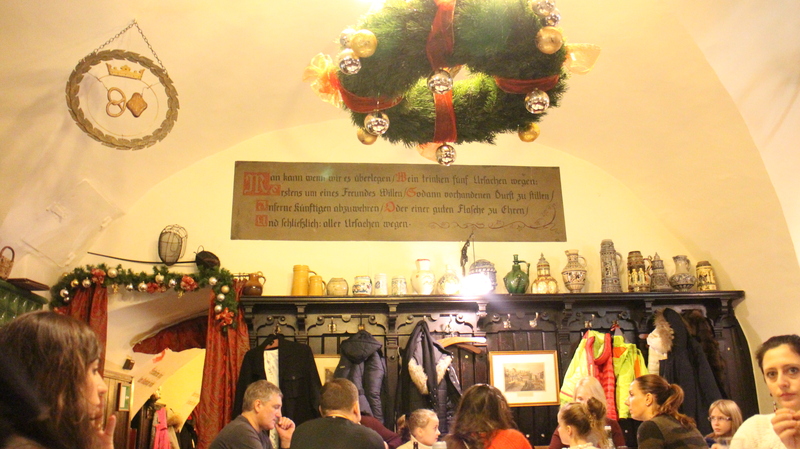 Although I have nothing bad to say about this place, I also wouldn’t hugely recommend it too… purely down to the fact that I’m sure there are lots more historic and more traditional cafes around. 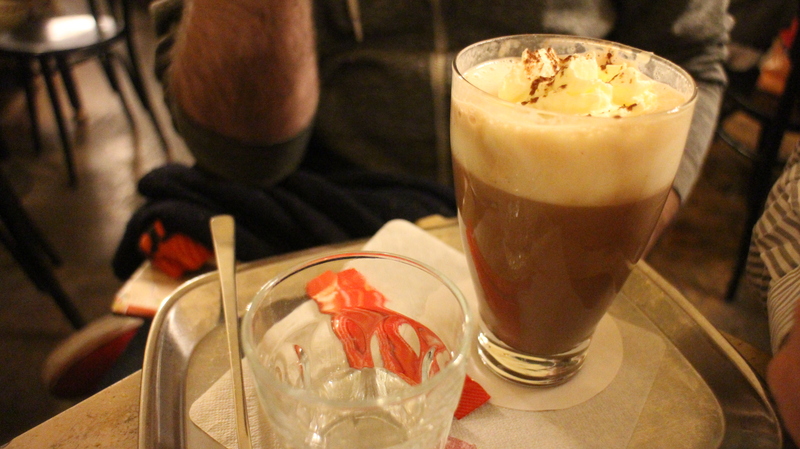 But as far as taking shelter from the cold, it did the job and the hot chocolate was pretty tasty. One word of warning, they didn’t accept cards so make sure you have cash on you if you do decide to go. 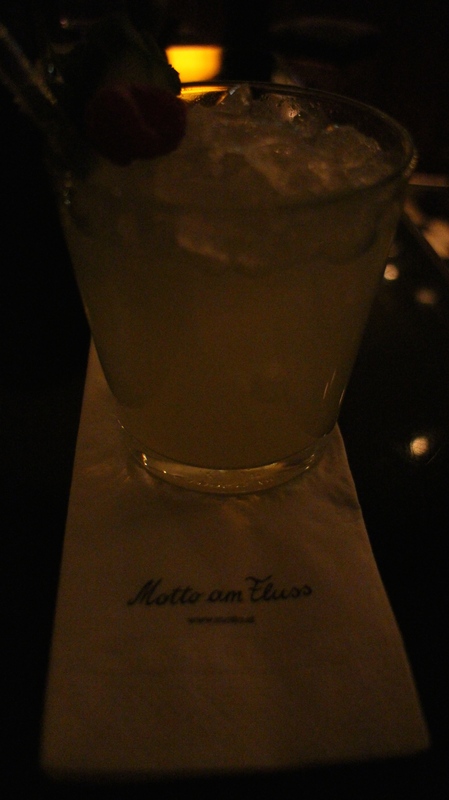 Pre-dinner drinks at Motto Am Fluss, a stunning canal-side bar which is about a 5 minute walk from the center. 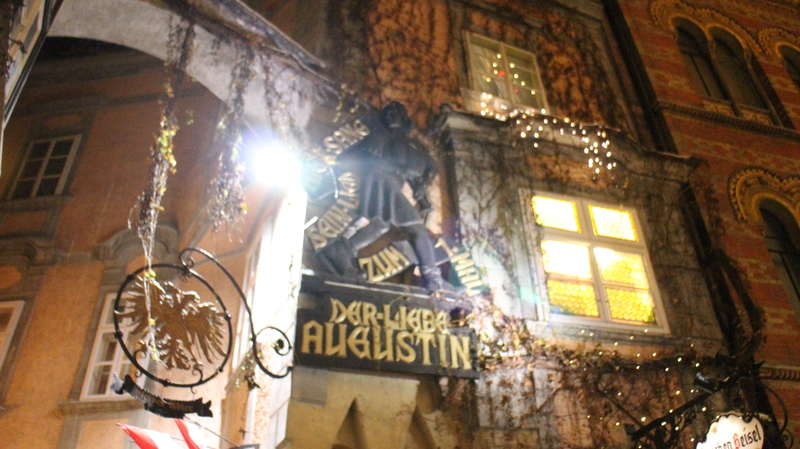 We had actually planned to go the the loft bar which isn’t too far from here, however they were fully booked so we needed to find somewhere for pre dinner drinks and stumbled across Motto Am Fluss while wondering back to the center. 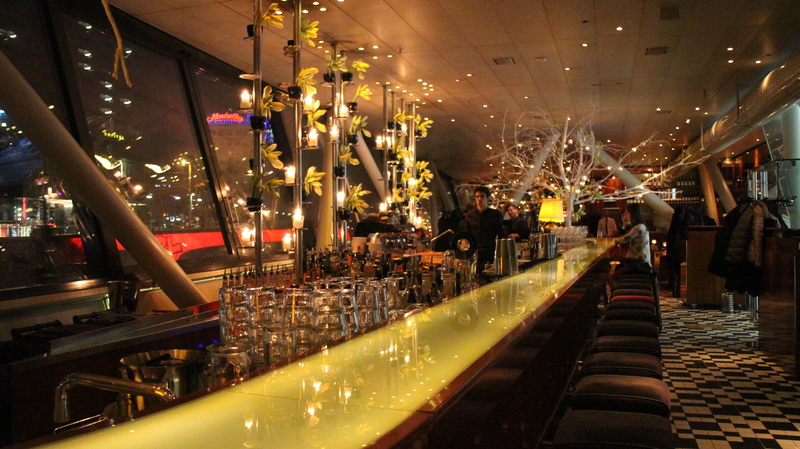 We noticed the stunning looking bar overlooking the canal and thought we had to check it out. It’s a slightly odd entrance… it’s almost like you’re walking through a terminal to get to the bar entrance, so if you feel you’re in the wrong place to get there then you’re probably not! 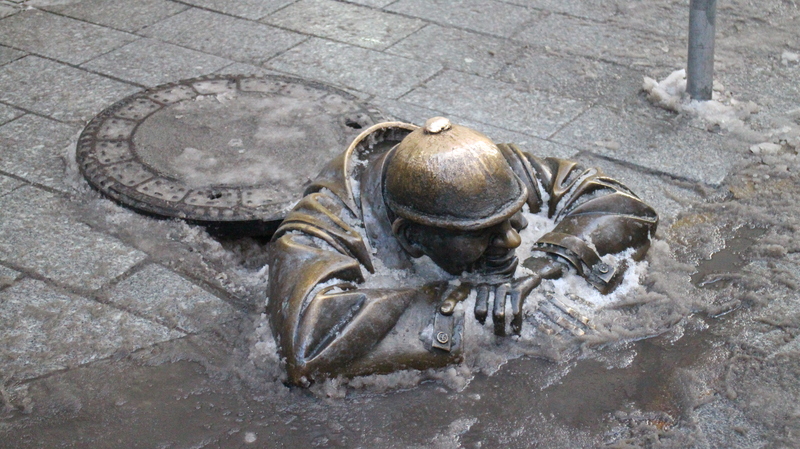 Keep walking… you’ll find it. 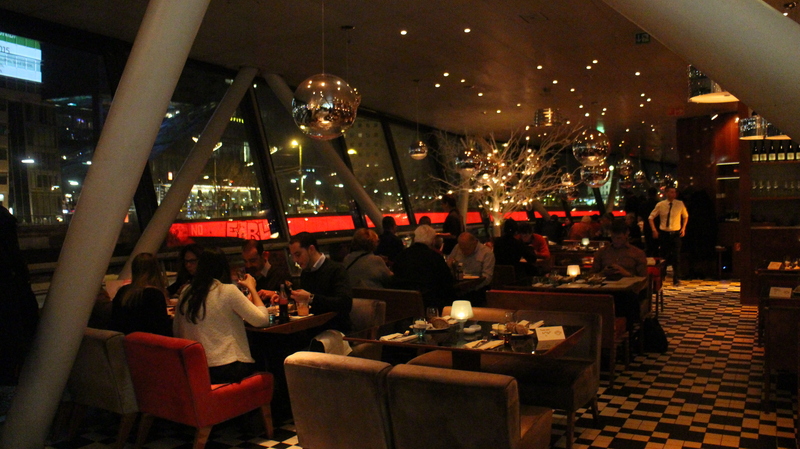 We were so impressed with this place, the interior was really cool and looked really beautiful. 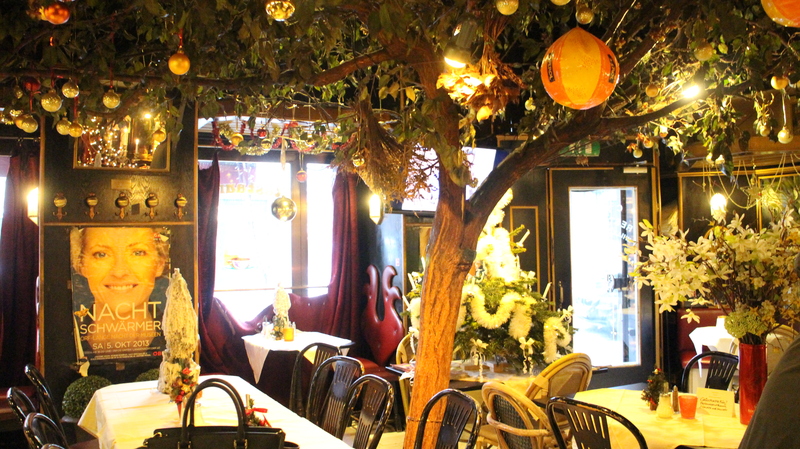 The staff were so friendly, very professional and helpful. We had a couple of cocktails here which were delicious and the bar tender didn’t hesitate to bring over some more complimentary nuts when we asked. 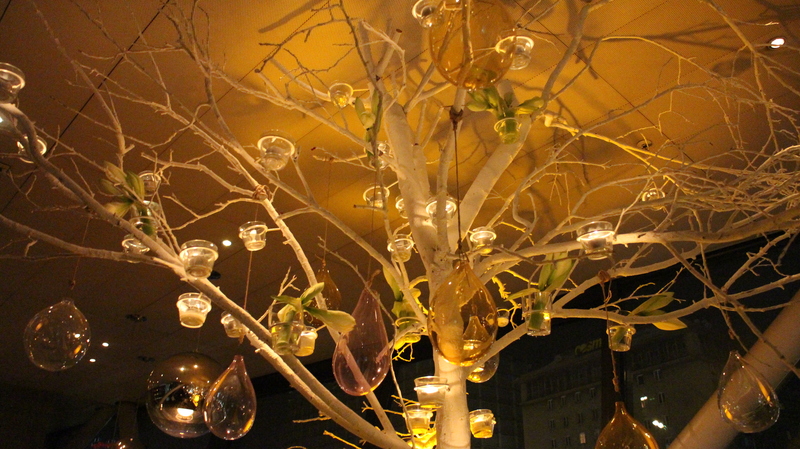 Great vibe, lovely drinks, amazing service. I would have been happy to spend hours in this place. 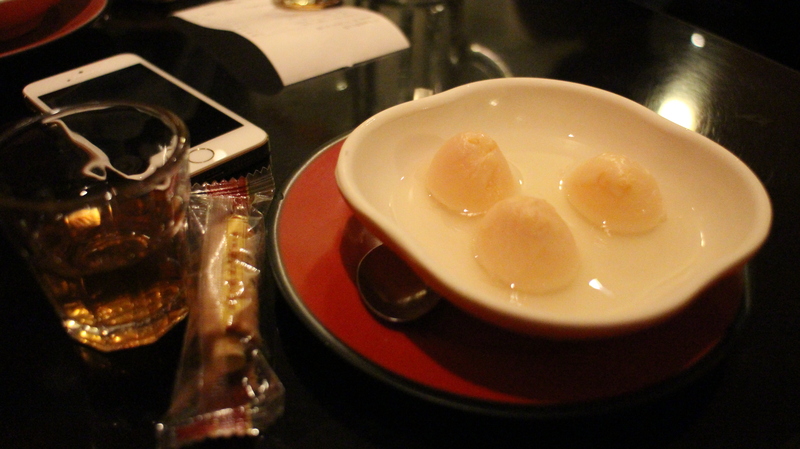 A big must on my list when visiting a new country is to make sure we go somewhere where you try the best of the local/national dish. I honestly don’t see the point traveling half way around the world to eat something you could have at home (with the acceptation of Sushi… we have sushi in pretty much every place we go – guilty). 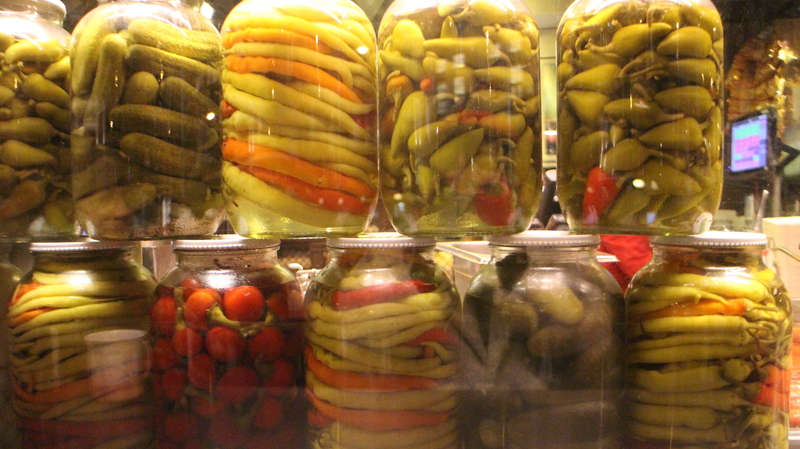 However on average I think you should eat the local food as much as possible. 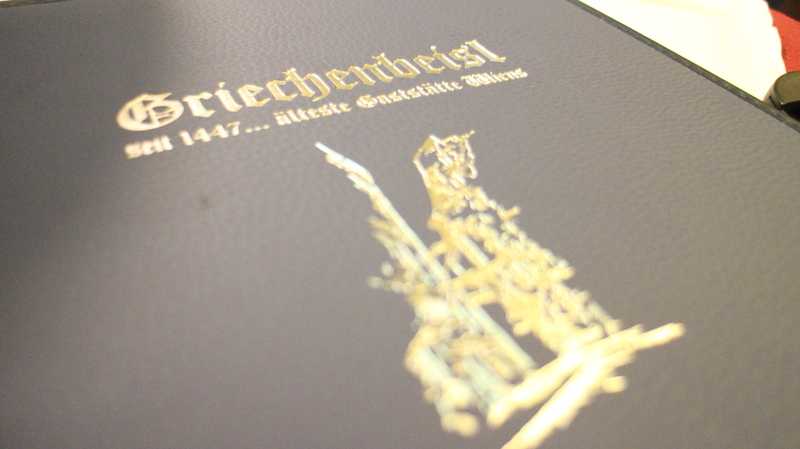 The national dish in Vienna… Wiener Schnitzel (thin, breaded and deep fried veal). 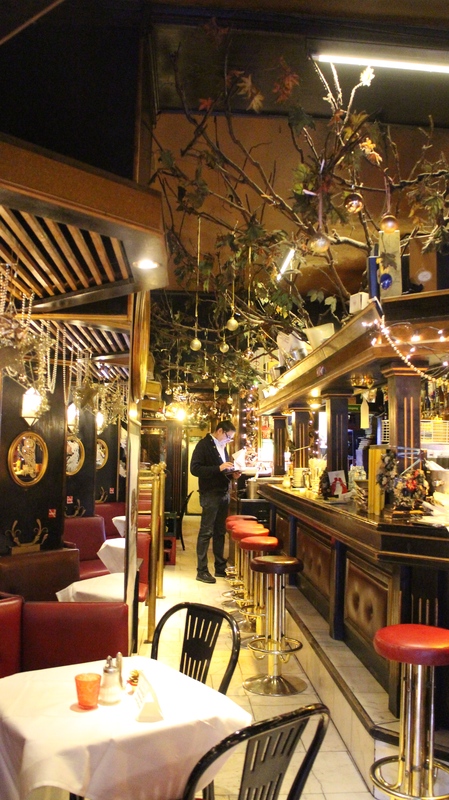 We had orginally planned to go to a popular restaurant in Vienna (I can’t actually remember the name of it) to have this, however when we asked our hotel to book it for us, it was fully booked, so they recommended this place instead. 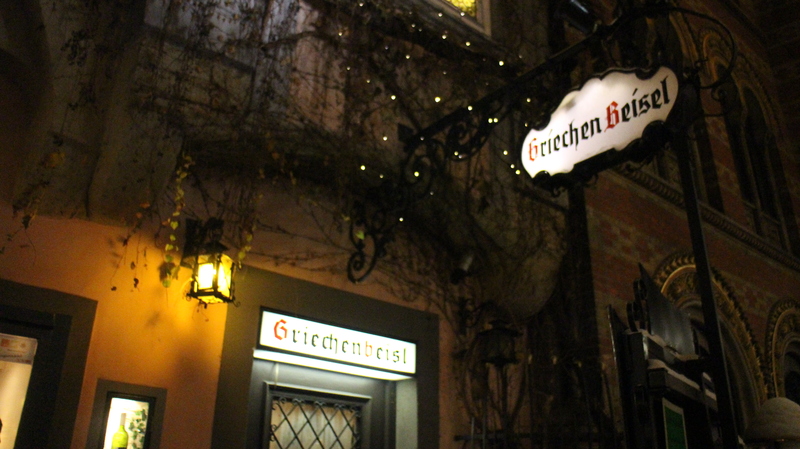 Griechenbeisl is one of the oldest restaurants in Vienna and it’s nestled away down a cute little entrance and it isn’t short of character! 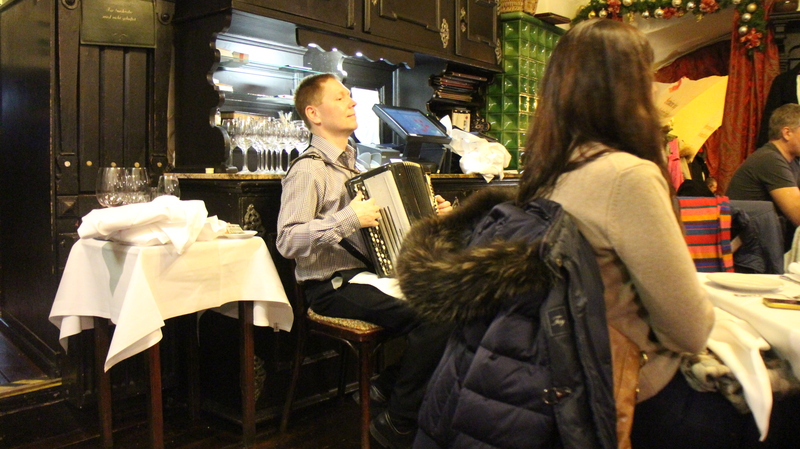 It was lucky we booked as there was a good 8 people waiting for a table – always a good sign in my eyes. 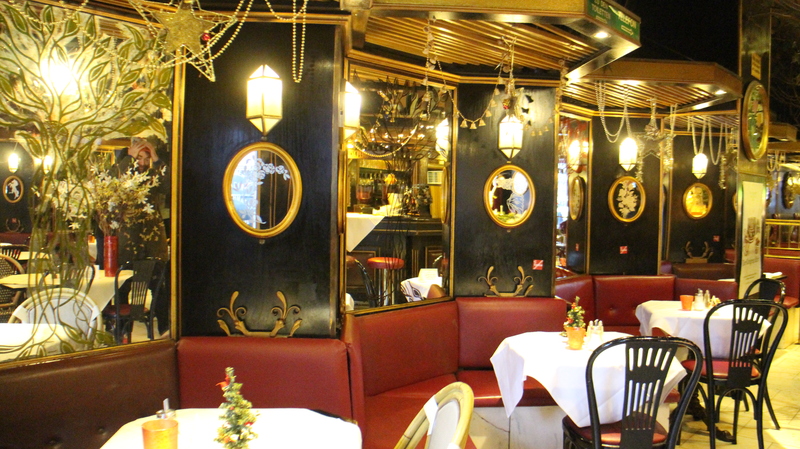 The restaurant has a number of little rooms with about 8 tables in each and it has this lovely cosy traditional feel to it. 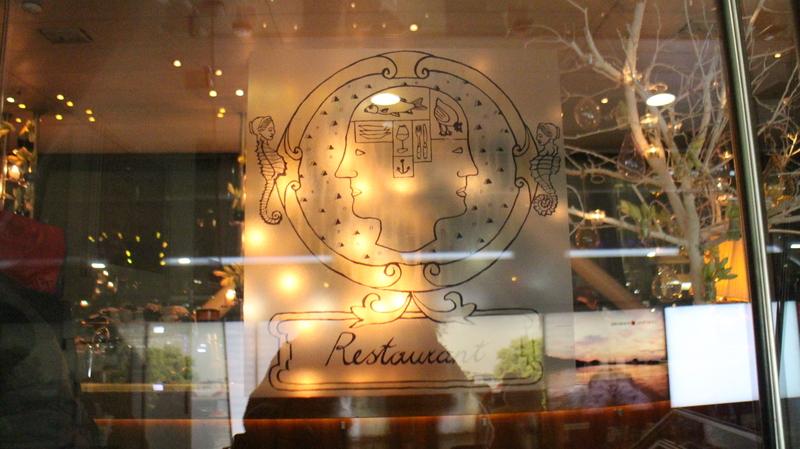 Our waiter was brilliant and although the food was pretty average, it was still lovely and worth a visit. 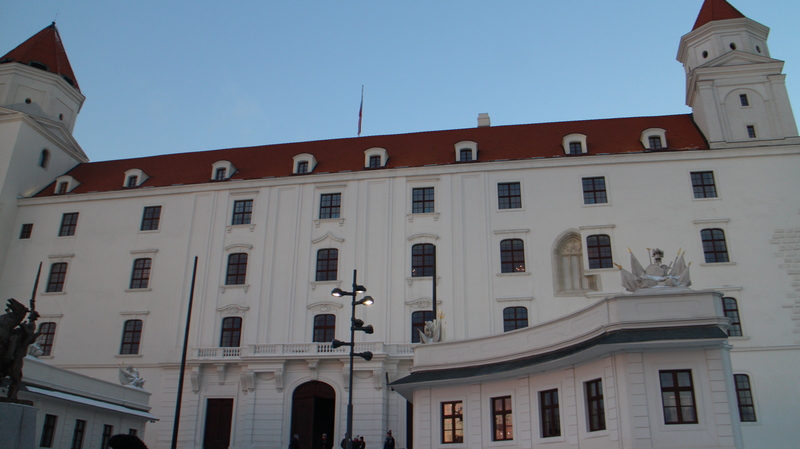 We started off the day with a trip to Belvedere Palace and Museum which was a bit of a walk from our hotel, I think it took us about 25 minutes to get there. 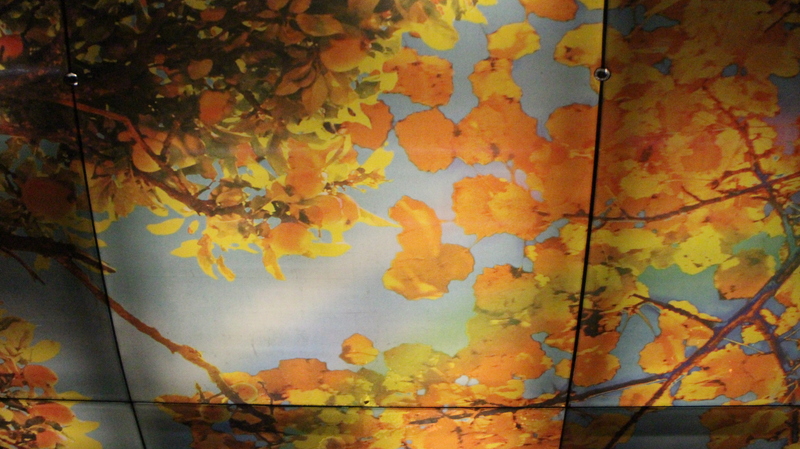 If you’re an art fan and love Monet and Klimt then you need to come here. The Monet exhibition was stunning and full of countless amounts of his pieces. 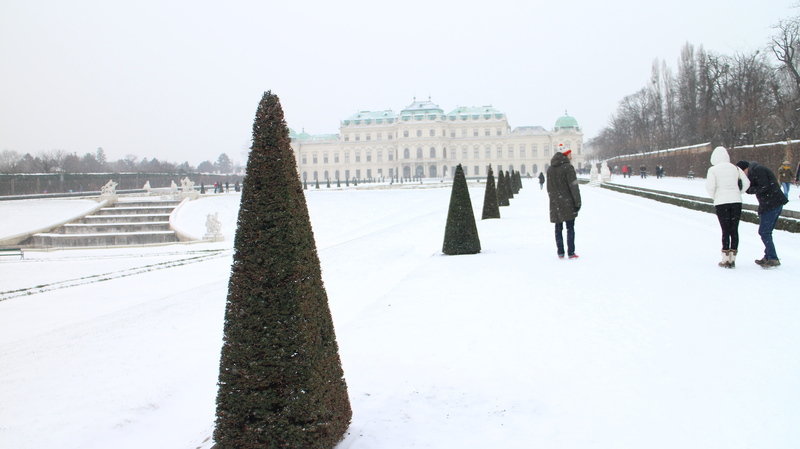 The walk from the museum that showed Monet’s art to the palace was across the grounds and was beautiful in the snow. 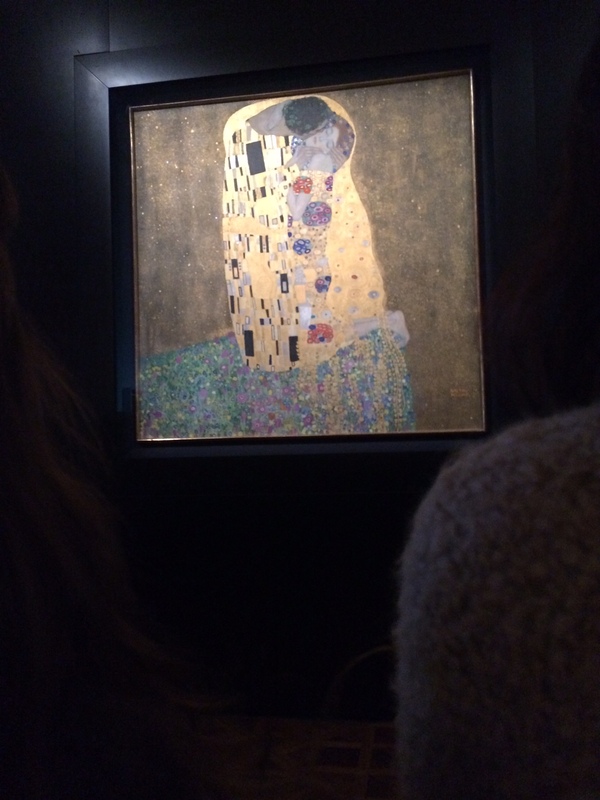 The palace had a number of Klimts pieces, including Austria’s most famous – The Kiss. Like it or not, it’s pretty impressive to see such a unique take on art. I would recommend getting yourself a audio guide too, it’s always so interesting to hear the back stories behind pieces of art – it gives you so much more application for the artist and the work you’re studying. 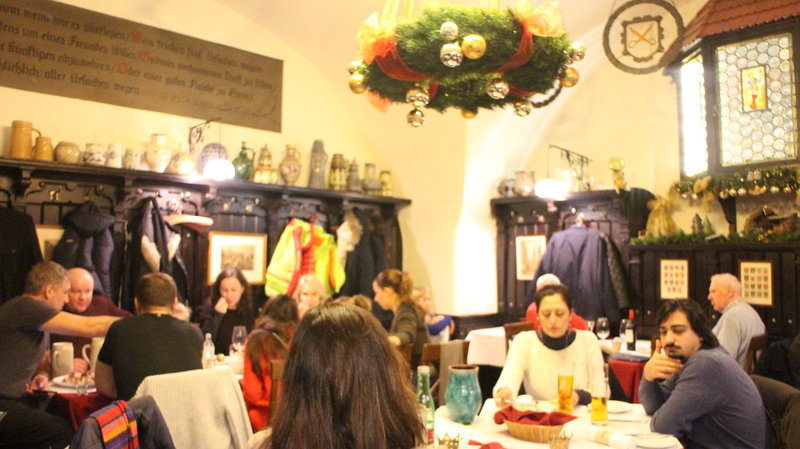 After walking from the Belvedere Palace and Museum to the Nachmarket, we were so cold and in after not having breakfast, we were in need for some food. 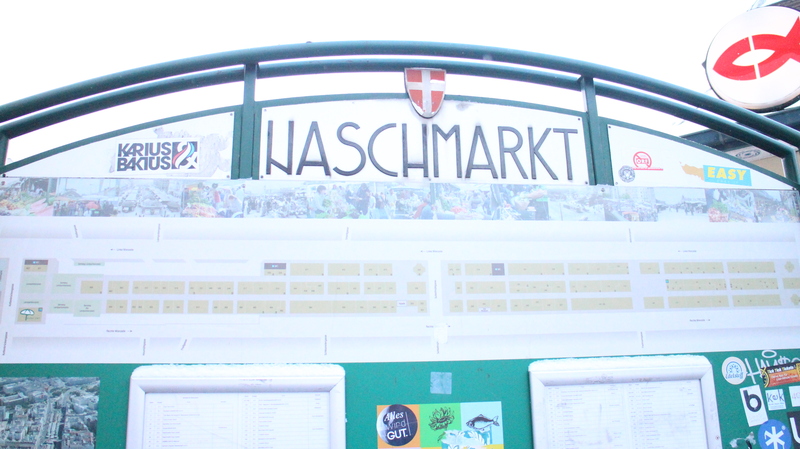 Most of the places for food in the Nachmarket were either outside stools or the places that were inside were full. 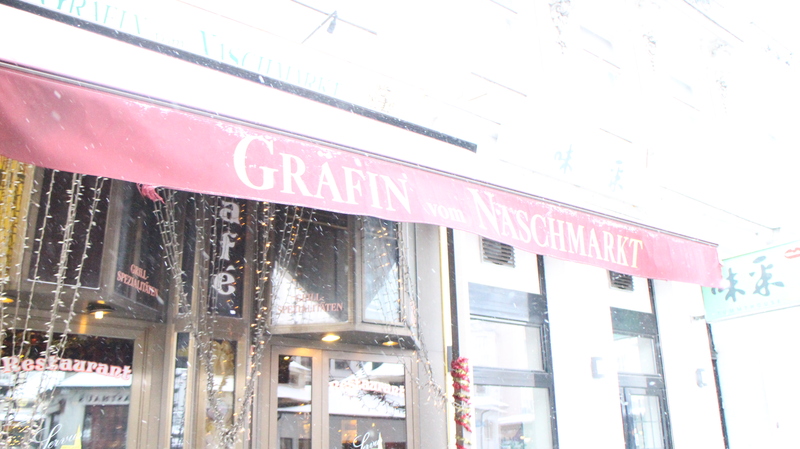 So we decided to give Grafin von Naschmarkt a go as it was right next to the market. I’ve since found out that this place has some bad reviews on tripadvisor which I find really confusing because I found this place quite good. 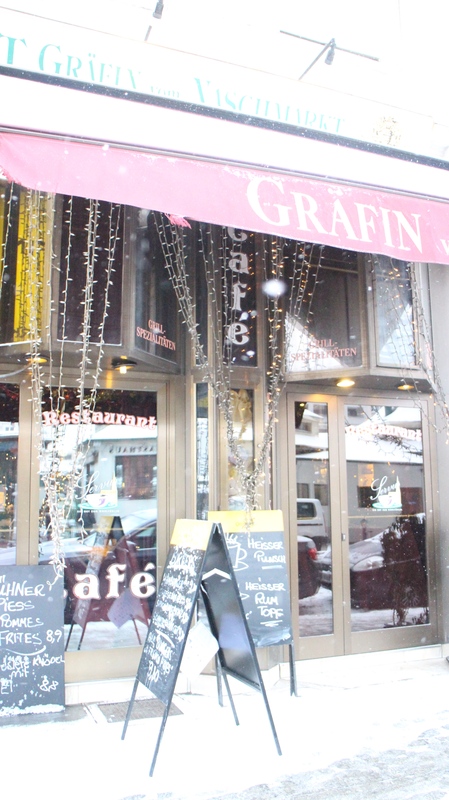 It’s got a really interesting interior, has a nice cosy feel to it, the service was great and the food we had was pretty good, not gormet but still not half bad. 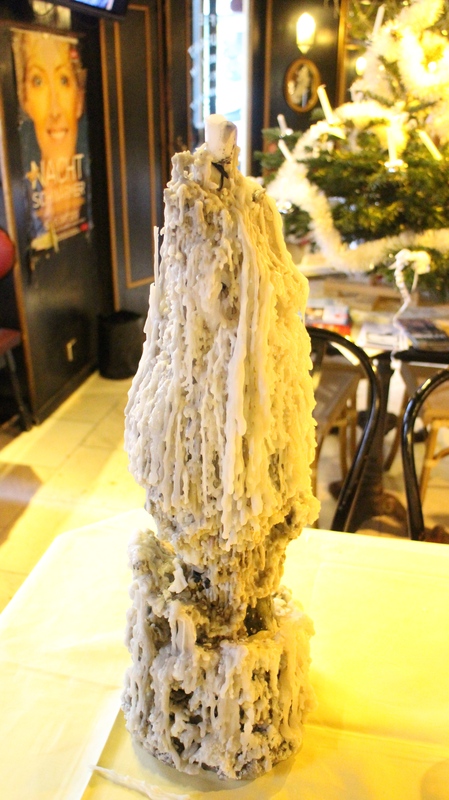 We ordered some red wine which wasn’t amazing but what do you expect with house red? For food we ordered a sausage platter for two (but between four it was more then enough!) It was a pretty straight forward platter of chips, sausage, sauerkraut and some other little bits and it was really nice – hard to get wrong but it hit the spot. I’m not sure if we just had a good experience here… but I really don’t think it deserves a poor rating. 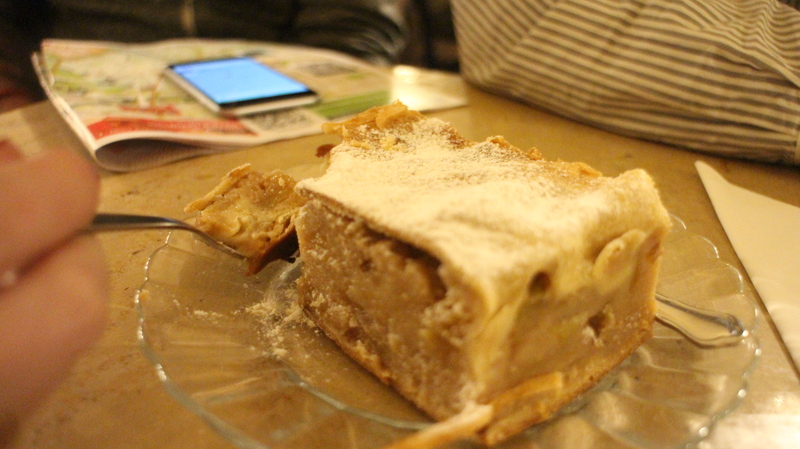 It was cute, cosy, good food and good service. Give it a chance and let me know if it was just down to us being lucky! I think a must in any country is to go and check out the food markets, you get such a good feel of the local food and national dishes and I also love to pick up some cured meats and spices to bring home. It can sometimes be a little overpriced, however I like the idea of supporting the community and sharing the love. 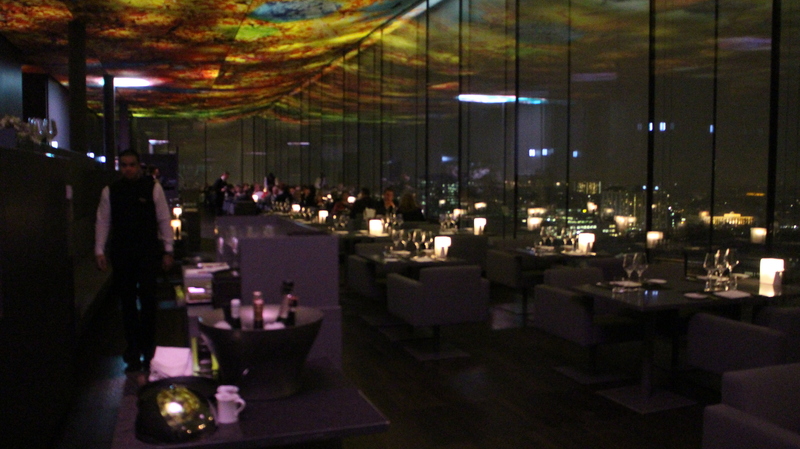 If there’s one place I would reccomend out of anywhere to go in Vienna, it is Le Loft at Sofitel Vienna. 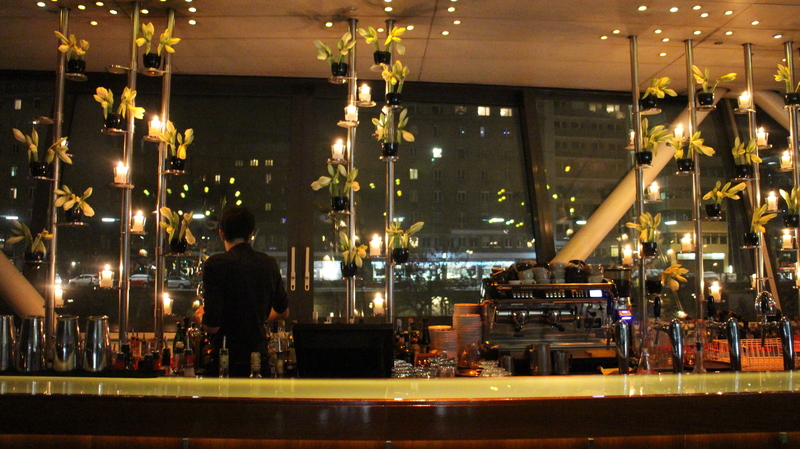 We went to Le Loft for pre-dinner drinks and were not disapointed – the view is breath taking! 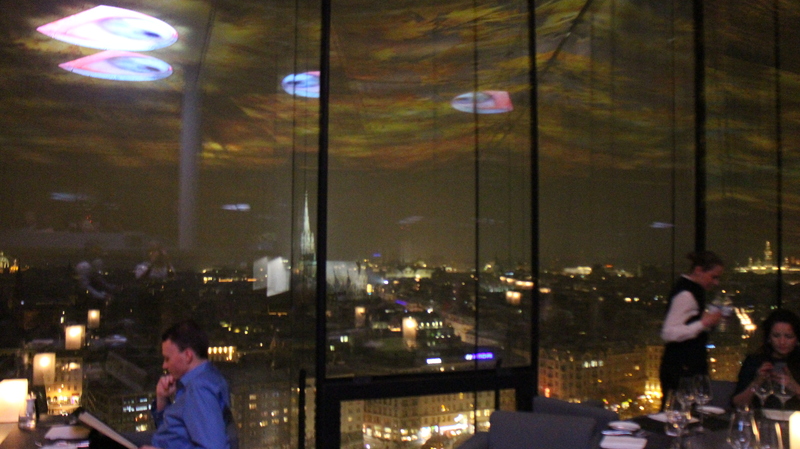 You get pretty much a 360 view of the city and at night it really is stunning. It’s not the cheapest… a cocktail is around £20 each, so be prepared to spend a good £100 on a couple of rounds. 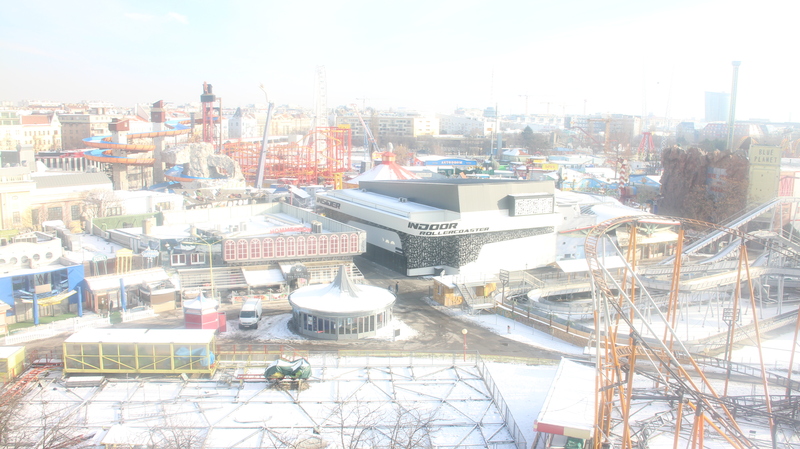 In my eyes though, it’s 100% worth the money for the service, view and general design and atmosphere of the place. A great excuse to get your cocktail dress out and an even bigger excuse to treat yourself. 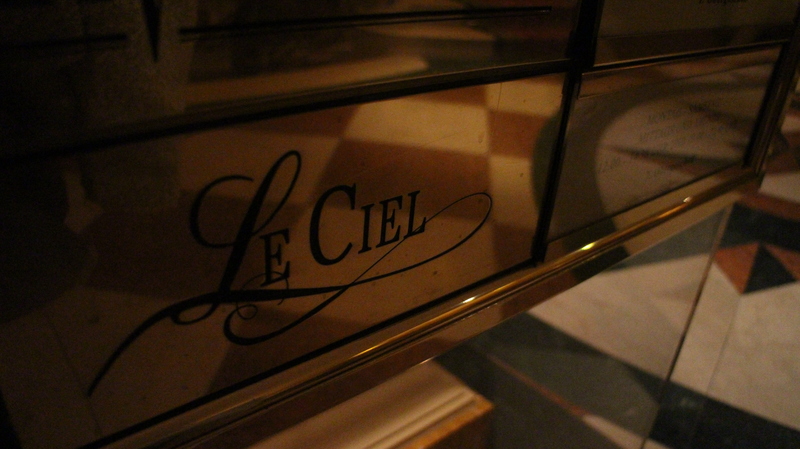 For dinner we went to Le Ciel which is pure indulgent opulence in Vienna. 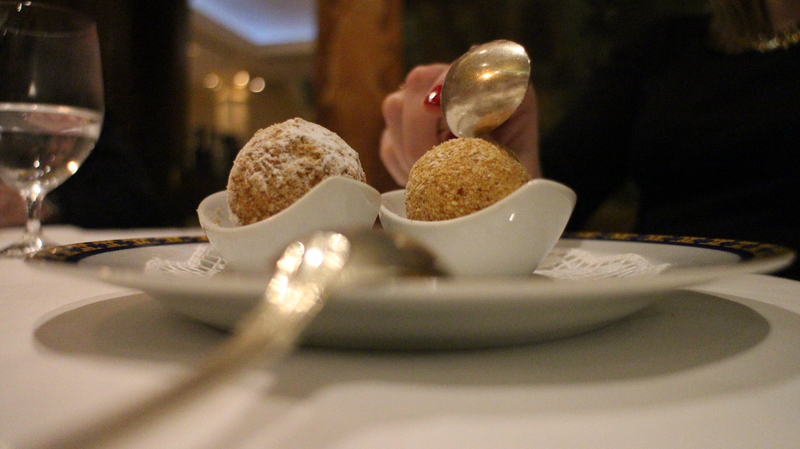 We chose from the a la carte menu and had some quite frankly delicious food which was sooo unctuous and delicious that I completely forgot to take photos of what I ordered for mains. 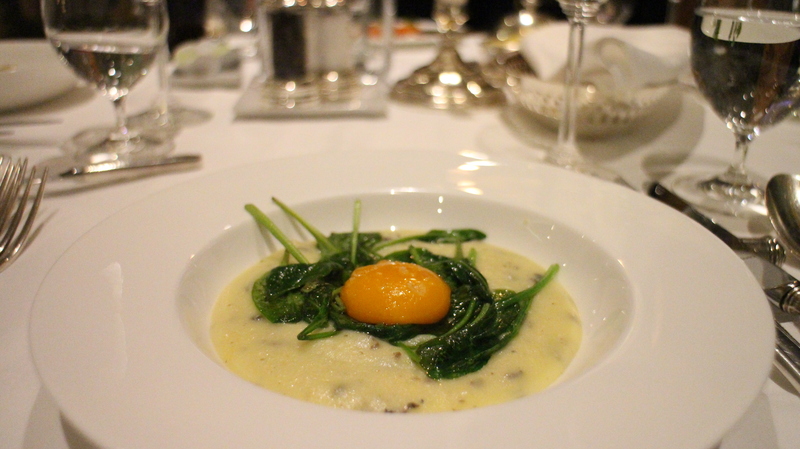 For my starter I had egg yolk confit, potato truffle cream, spinach and smoke aroma. For mains, beef tenderloin with bone marrow crust, swiss chard and balsamic vinegar shallots. 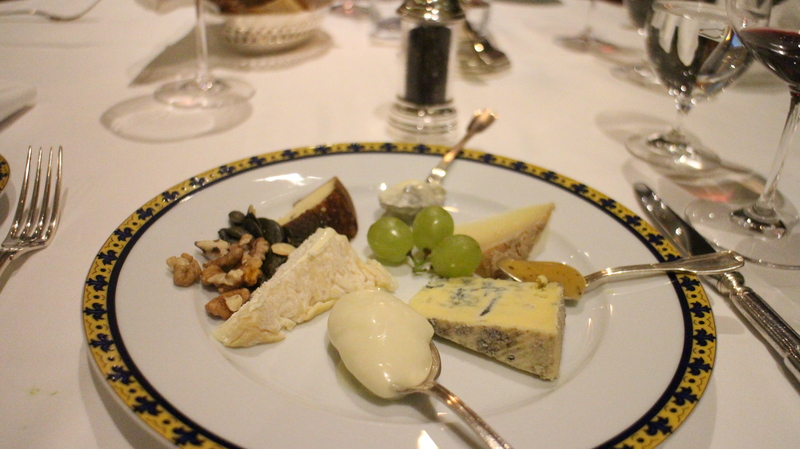 Deserts was the best plate of cheese you could ever imagine paired with a stunning red Austrian wine. 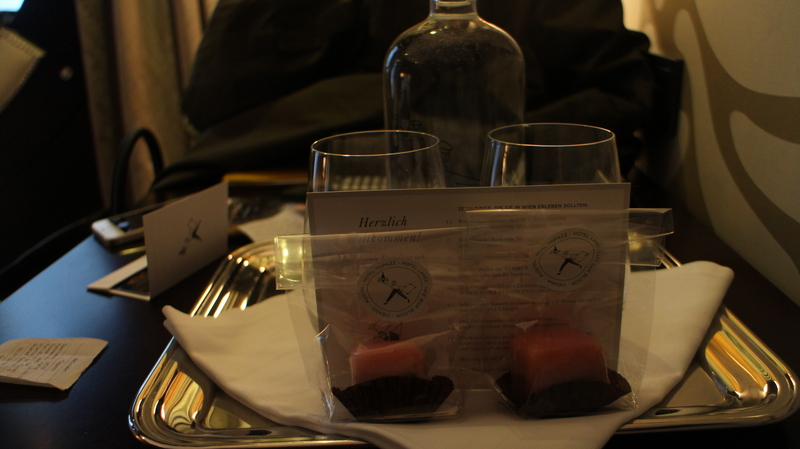 We also got a few complimentary sweet treats which were lovely. 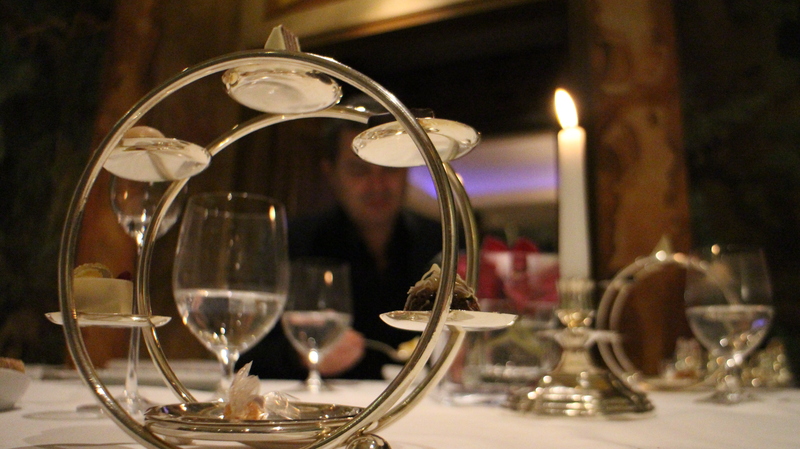 A pricey dinner but for the service and quality of food and drink you get it is 100% worth it. 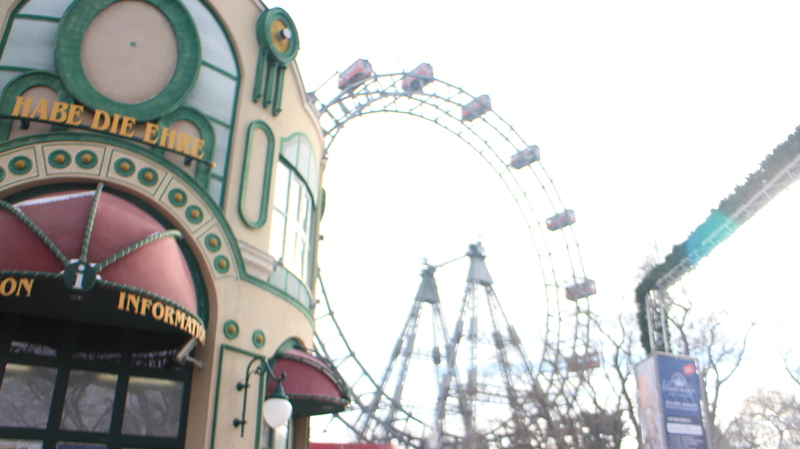 Vienna is really close to Bratislava so we decided to take a day trip on our second to last day. My dad and Suzie were leaving early so they didn’t come with us, to be honest it’s not particularly their thing so it worked out well. Once we got to the center we were pretty cold and in need of some serious warming up. 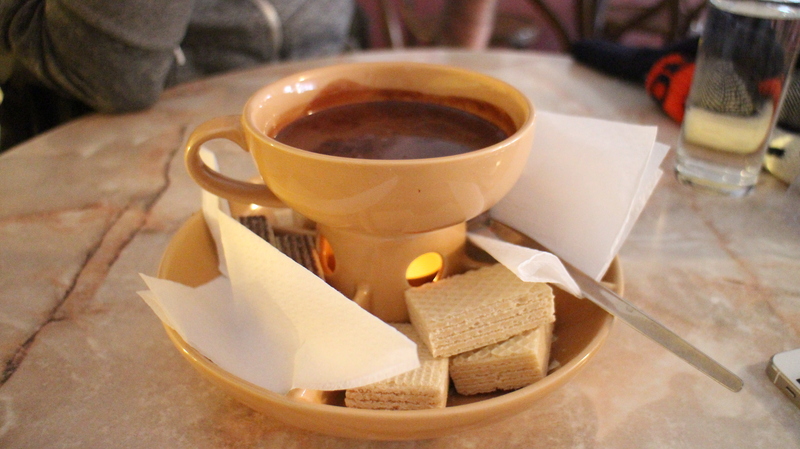 Luckily we found this little cafe in the center that was serving these amazing bowls of melted chocolate that also come with different flavored wafers to dip in, it was just what we needed. I never normally forget to note down where we stop but this time I did so unfortunately I can’t tell you the name of this place, but if you go to the center and get to a square it’s in the square (rubbish instructions, sorry!). 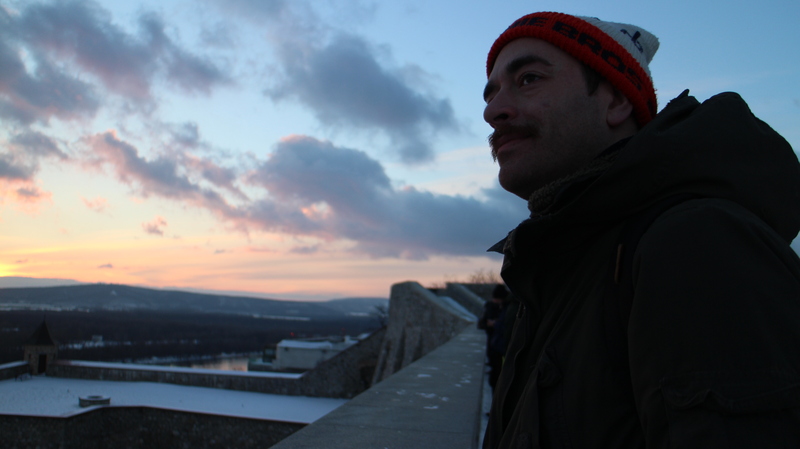 There isn’t a huge amount to do in Bratislava, after having our bowl of chocolate, we took a stroll up to the castle at the top of the hill which was pretty amazing as you can overlook the whole city – great views. 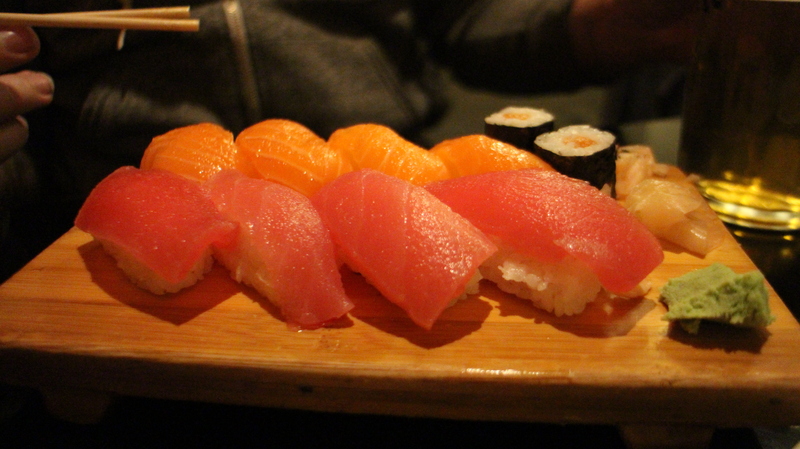 One thing Laurence and I love to do in different countries is check out a place that serves our favorite (okay, my favorite) food – sushi. It’s normally way cheaper in other countries then in the UK so I always want to take advantage of that and get a good few California rolls in before we leave. 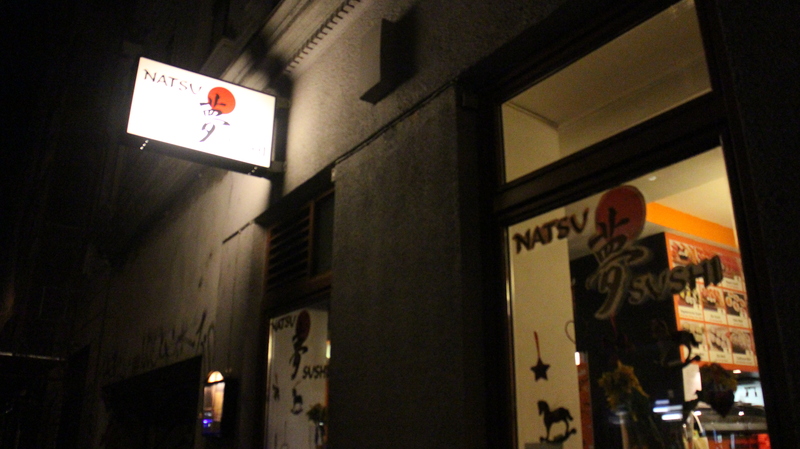 Laurence found a place called Natsu which was a little walk from the Naschmarket we went to a few days before, it had some great reviews so we thought we’d check it out. 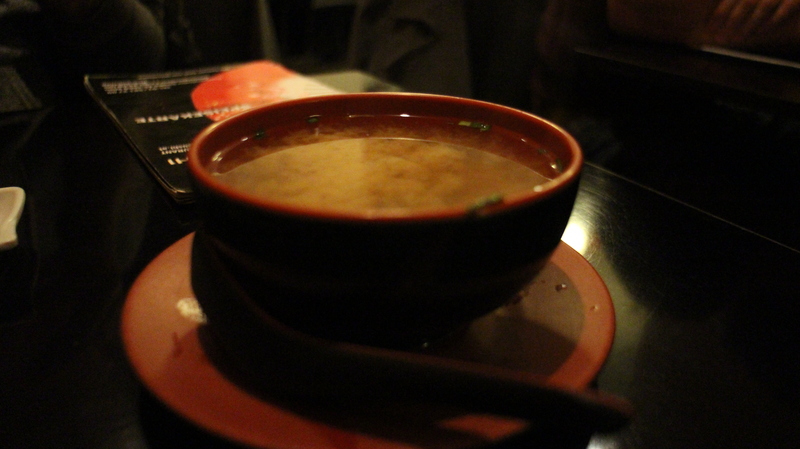 Natsu was a small little restaurant that has about 12 tables so it has a really great cosy, personable feel to it. It’s a good thing we have sushi a lot because the waitress only really spoke Japanese and German, luckily we knew the food we wanted and were able to point at the menu to place our order. 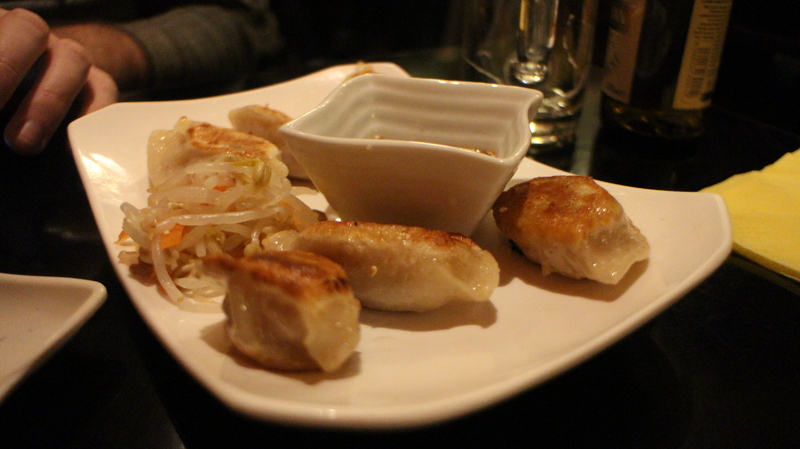 Not only was the food amazing, great quality fish, crispy and juicy gyozas and warming miso soup. 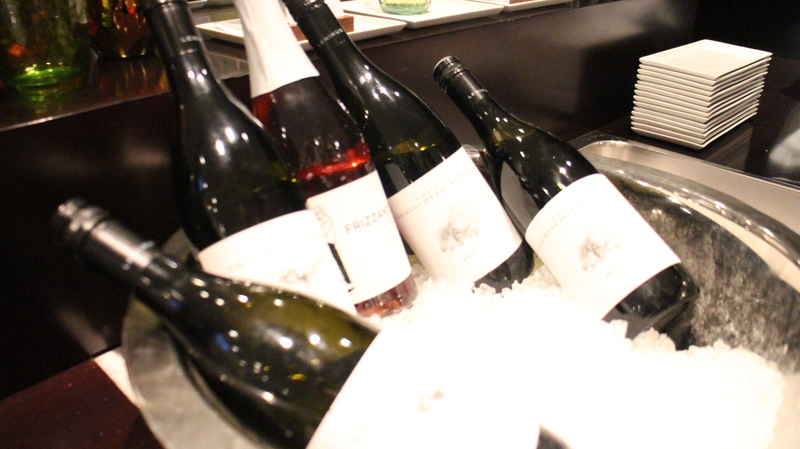 The wine wasn’t amazing… my tip would be go for a soft drink or a beer. It turned out we had ordered a load of the food from the half price menu and our bill only came to 28 euros which is unbelievable. This would have cost about £40 in London! 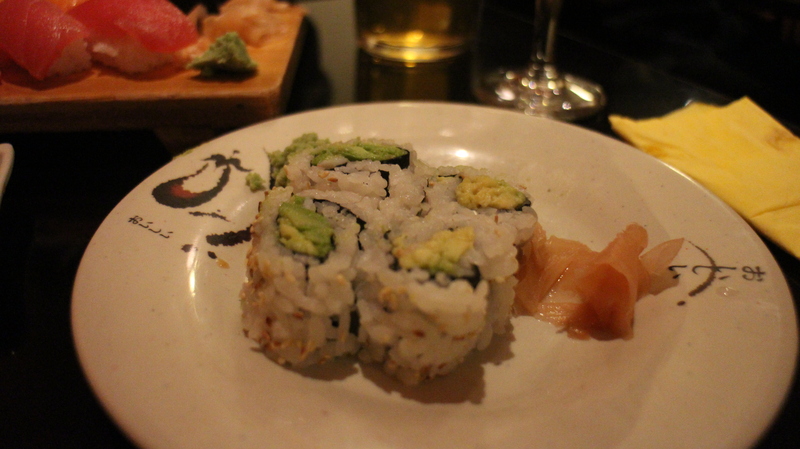 If you’re a sushi lover like me and you’re looking to get your hit then check this place out – you won’t be disappointed. The ferris wheel cost about 30 euros for the both of us and if I’m honest, it totally wasn’t worth it. 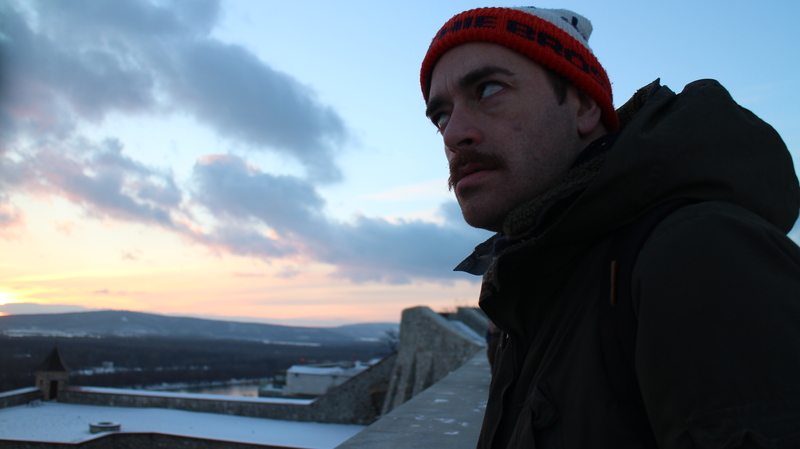 You got an okay view of the city, however the cabins are pretty old and worn. You would be a lot better getting the amazing view from Le Loft instead… I wasn’t that fussed about it being rubbish as we had time to kill before our flight. All that was left to do was go check out a local supermarket (I love doing this when we go away), buy some cold meats and cheeses to take back with us for our New Years party back at home, grab our suitcases from the hotel and jump on the train to the airport. I would 100% reccomend taking the train to the airport, for a taxi it costs 40 euros to get to the airport, however train tickets are about 13 euros each. It’s really easy to get the metro to the station you go from and the train is direct to the airport and from there it’s really easy to find your way to the terminal. Save some money and train it!